We’d love your help. 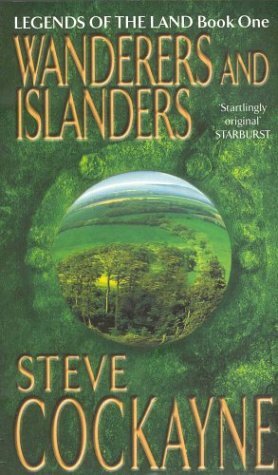 Let us know what’s wrong with this preview of Wanderers and Islanders by Steve Cockayne. To ask other readers questions about Wanderers and Islanders, please sign up. Somehow I really had trouble getting into the story. The plot is fascinating, but complex and although normally I like complex, this time it was a bit too much. Still, somehow I really wanted to know what this story is all about and I can't say it is a bad story. Maybe it wasn't the right story for me at this time, but it pleased me enough to read book 2 immediatly after this one. This review has been hidden because it contains spoilers. To view it, click here. Perhaps one of the more unusual fantasy books I read growing up, Wanderers and Islanders tells three interlinked stories. Rusty Brown, a young red-headed boy who dreams of being a cartographer; Leornado Pegasus, former court magician and Victor Lazarus, an ex-major who is mysteriously ordered to renovate an old house. Rusty is one of my favourite characters in the series and I like him because he's so well drawn, i.e. the little details like the fact he always keeps his socks on in bed. After an Perhaps one of the more unusual fantasy books I read growing up, Wanderers and Islanders tells three interlinked stories. Rusty Brown, a young red-headed boy who dreams of being a cartographer; Leornado Pegasus, former court magician and Victor Lazarus, an ex-major who is mysteriously ordered to renovate an old house. Rusty is one of my favourite characters in the series and I like him because he's so well drawn, i.e. the little details like the fact he always keeps his socks on in bed. After an encounter with Wanderer girl Laurel (Wanderers are akin to Gypsies or Irish Travellers in the real world), his life changes forever and he leaves the village to become a map-maker. Cockayne's prose is simple and serviceable, and the story is quite a fun, trippy read. I picked this book up, the first of a trilogy, without really knowing a great deal about the storyline and was pleasantly surprised by it. Essentially, Wanderers and Islanders is three stories in one, although as the book goes on it becomes clear that those three stories are heavily interlinked. One storyline focusses on Leonardo, who has been a court magician for longer than he can remember, and whose focus is on finding ways to look into the future. The second is that of Lazarus, hired to overs I picked this book up, the first of a trilogy, without really knowing a great deal about the storyline and was pleasantly surprised by it. Essentially, Wanderers and Islanders is three stories in one, although as the book goes on it becomes clear that those three stories are heavily interlinked. One storyline focusses on Leonardo, who has been a court magician for longer than he can remember, and whose focus is on finding ways to look into the future. The second is that of Lazarus, hired to oversee the renovation of a mysterious house within which a dark presence lives. Thirdly, there's Rusty, a young boy who meets a young woman from the Wanderers in his childhood, after which nothing will ever be the same again. I appreciate the web the author is trying to weave here, but it's chaotic and disjointed. Its other main problem is the low-key writing. It just sort of mumbles and mutters onward, never really raising its voice to be heard above the fantasy din. Another book I tried to read but couldn't. I borrowed the whole series from the library and read only the first book. Confusing storyline, just as I thought I made some sense of it, it twists and turns and loses me completely... I finished the first book and decided I didn't want to waste any more of my time on the series. I am really confused by the ending and I feel like there are multiple loose ends; hopefully, the next book will clarify some things.